M. Muller, Cryopreparation of Microorganisms for Electron Microscopy. U.B. Sleytr, P. Messner, and D. Pum, Analysis of Crystalline Bacterial Surface Layers by Freeze-etching, Metal Shadowing, Negative Staining, and Ultra-thin Sectioning. J.R. Golecki, Analysis of Structure and Development of Bacterial Membranes (Outer, Cytoplasmic and Intracytoplasmic Membranes). J. Lalucat, Analysis of Refractile (R) Bodies. K. Zierold, Electron Probe Microanalysis of Cryosections from Cell Suspensions. R. Bauer, Electron Spectroscopic Imaging: An Advanced Technique for Imaging and Analysis in Transmission Electron Microscopy. G. Acker, Immunoelectron Microscopy of Surface Antigens (Polysaccharides) of Gram-Negative Bacteria Using Pre- and Post-embedding Techniques. M. Rohde, H. Gerberding, T. Mund, and G.-W. Kohring, Immunoelectron Microscopic Localization of Bacterial Enzymes: Pre- and Post-embedding Labeling Techniques on Resin-embedded Samples. J.W. Slot, A.H. Weerkamp, and H.J. Geuze, Localization of Macromolecular Components by Application of the Immunogold Technique on Cryo-Sectioned Bacteria. H.-D. Tauschel, Localization of Bacterial Enzymes by Electron Microscopic Cytochemistry as Demonstrated for the Polar Organelle. J. Golecki, Electron Microscopy of Isolated Microbial Membranes. F. Mayer and M. Rohde, Analysis of Dimensions and Structural Organization of Proteoliposomes. E. Spiess and R. Lurz, Electron Microscopic Analysis of Nucleic Acids and Nucleic Acid-Protein Complexes. W. Johannssen, Interaction of Restriction Endonucleases with DNA as Revealed by Electron Microscopy. A. Holzenburg, Preparation of Two-Dimensional Arrays of Soluble Proteins as Demonstrated for Bacterial D-Ribulose-1,5-bisphosphate Carboxylase/Oxygenase. H. Engelhardt, Correlation Averaging and 3-D Reconstruction of 2-D Crystalline Membranes and Macromolecules. Index. Contents of Previous Volumes. 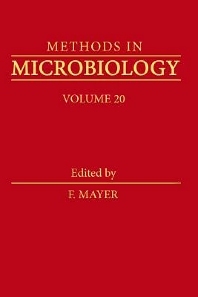 This volume of this acclaimed series deals with electron microscopic techniques applied for the elucidation of microbial structures and structure-function relationships at cellular, sub-cellular, and macromolecular levels. Many of the recent findings on ultrastructural features of microorganisms have been obtained with newly developed methods, though classical approaches have not lost their validity. Therefore, both conventional and new methods have been incorporated into this volume. The topics dealt with are meaningful not only in bacterial cytology but also in physiology, enzymology, biochemistry, and molecular biology, and include aspects of medical and biotechnological application. Basic and medical microbiologists, cell biologists.